The Raspberry Pi Case Designed by Apple: Modding the Might Mouse Case for the RasPi #piday #raspberrypi @Raspberry_Pi « Adafruit Industries – Makers, hackers, artists, designers and engineers! …The Magic Mouse is a superb device. It’s slick. It’s smooth. It’s beautifully built. In fact, even the packaging is beautifully built – and out of better quality plastics than most other manufacturers use for their actual mice. And therein lies the problem. The shipping container is a beautiful piece of gleaming, transparent, polycarbonate. What is one supposed to do with it? Keep the mouse in it? The trouble is that the mouse doesn’t work so well in its box. Actually, it doesn’t work at all – it’s impossible to click and it utterly fails to move the cursor around. Throwing it away seems a little wasteful too. The box is lovely. The box is also just about the right size for a Raspberry Pi. In fact, the size match is so perfect that its hard to believe that no one else has considered the Magic Mouse box to be the ideal Pi case. I Googled about a bit, and got no hits – so either I really have had an original idea, or everyone else is staying very quiet about this most cunning of cunning plans. Needless to say, a small amount of modification is required in order to squeeze the ‘Pi into the mouse house. Quite apart from anything else it would be a useless pretty case if one couldn’t connect up the cables to the computer, and anyway the Raspberry Pi doesn’t quite fit – the headphone and composite jacks stick out a little bit too far. Reshaping the box appropriately is a (fairly) simple task with a Dremel although, with hindsight, a few more bits might be required to do the job perfectly. As you can see, the end effect is rather nice. 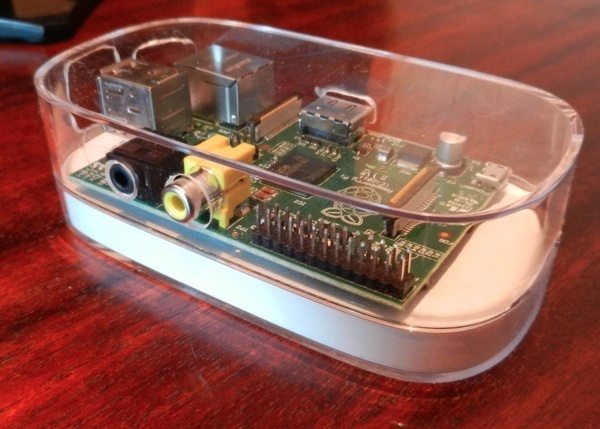 It’s a Raspberry Pi designed by Jonathan Ive. 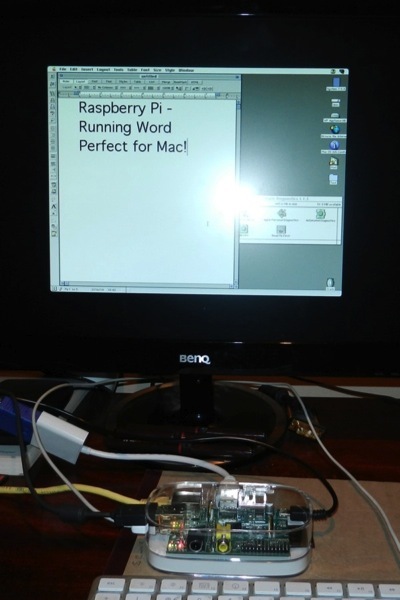 An Apple and Raspberry Pi….